DESCRIPTION A well appointed ground floor purpose built apartment which is accessed via a carpeted entrance hall with entry phone system. The property has a generous sized hall leading through to a lounge with door to the outside, and well equipped kitchen with numerous integrated appliances. There are two good sized bedrooms, with the main bedroom having fitted wardrobes. The bathroom is fully tiled and the full suite includes a shower cubicle. The property benefits from double glazed windows and gas fired heating to radiators. To the outside are pleasant communal gardens and an allocated parking space. 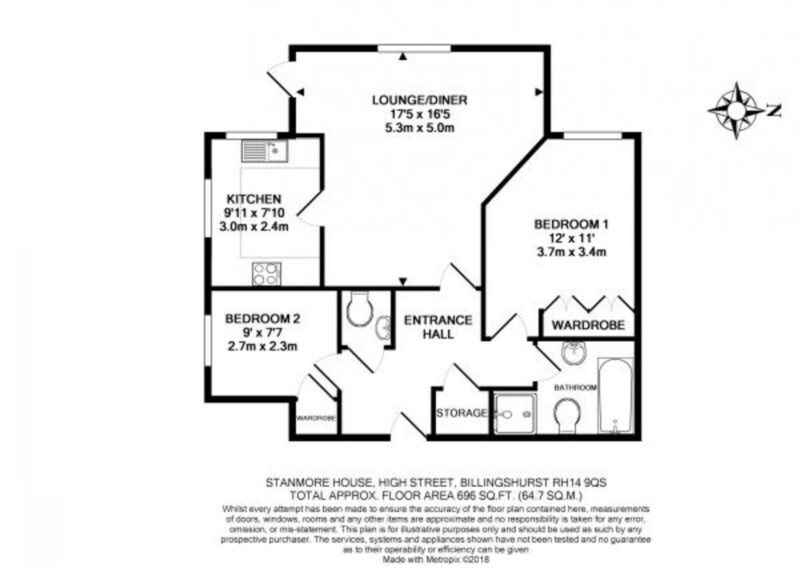 Undoubtedly a feature of the property is its location, being situated on the High Street of Billingshurst which gives excellent access to the village amenities with its good range of independent stores, restaurants and two public houses and there is also a Sainsbury's supermarket. The train station with its regular access to Gatwick and London is also very accessible. HALL Night storage heater recessed shelved cupboard. CLOAKROOM Concealed cistern w.c., wash hand basin with mixer tap, mirror fronted medicine cabinet, tiled floor, tiled walls, extractor fan, radiator. KITCHEN Double aspect, comprising: worksurface with inset single drainer sink unit with mixer tap having base cupboards and drawers beneath, fitted washing machine, further matching 'L' shaped worksurface with base cupboards and drawers beneath, integrated four ring gas hob with stainless steel fronted oven under, stainless steel splash back with extractor hood above, integrated fridge/freezer, eye-level units, wall-mounted gas fired boiler, two double glazed windows, hard wood floor covering, recessed spot lights. BEDROOM ONE Fitted wardrobes, radiator, double glazed window, recessed spot lights. BEDROOM TWO Radiator, double glazed windows, walk-in cupboard. BATHROOM Fully tiled walls with a white suite comprising: panelled bath with mixer tap and hand held shower attachment, separate tiled shower cubicle with mixer shower, wash hand basin with mixer tap, mirror over and light/shaver point, concealed cistern w.c., mirror fronted medicine cabinet, chrome heated towel rail, tiled floor, recessed spot lights. OUTSIDE Pleasant well maintained communal gardens are found predominantly towards the rear of the development where there is also an allocated parking space and a bicycle store.